Mennonite Girls Can Cook: Please Help !!! Mystery Solved !! I knew our 'smart' readers could do it ! Thank you soooo much !!! You are all wonderful ! 'thetroikatable' found a picture of it on line dispelling all doubt ! ***At the end of the day ..... Thank you one and all for your interest and your comments. Thorstenveblen, I'm sorry you were bored with my 'fun' post but you are certainly entitled to your opinion... Maybe you just had a bad day ... but I did have to smile at Miss Manners who so politely reminded you to mind yours ! I agree that Foley Fork seems to be the more reasonable answer but it does not seem to follow the normal design of handle ... it is fat and awkward to hold.... here is a photo of it held in a hand. Sarah C , I appreciated you e-mailing the company .. what an interesting response! I'm very curious to see if there is a response from the Germany office. I thought Esther's idea of a pastry/decorating tool was interesting and I am going to try that. Tracy, I'm sorry but my husband forgot where he bought it ... we tried to retrace his 'journey' a couple of days after he brought it home but we could not find another in any of the places he remembered being --- so I'm afraid I can't help you! All of your suggestions and ideas were helpful and I enjoyed reading them all ! Thank you so much for making my day !! she had in a Middle East home. The women gathered there were eagerly offering advice to a young bride. One older woman said... "Ohh.. absolutely necessary is for you to have a Motkhenna." The author, not familiar with that Arabic word asked what a Motkhenna was. The older woman looked her askance! "You do not know what a Motkhenna is ?" "A Motkhenna is important in the kitchen. You can grind wheat or corn for cakes and bread. And you can grind vegetables and tomatoes for sauces. It is 'daruri' (essential) for every wife's kitchen!" Smiling politely, the author agreeed to make sure she looked for one next time she was shopping. How could she describe her high-powered food processor to a woman who thought her ill-equipped without a stone grinding slab in her kitchen? We recognize that almost as important as as a well stocked pantry, are the appliances and utensils that make our kitchen user friendly. Some time ago ... my pastry blender broke and I noted a request for another on the shopping list I handed my husband. Thinking that there must be a pastry blender better than the one I'd broken, he came home with a strange utensil that I had no idea what it was. No one I have asked has had any idea either ! Now .. I love a good handy kitchen utensil ... but what do you do with a perfect good utensil for which you have no use ?? So, I have pictured my utensil in the above photo .. and throw out a challenge! Can anyone solve this mystery for me ? PLEASE? Surely someone out there must know what it is for !! I believe it's a Foley fork. My grandmother had one and it was used for mixing, blending, mashing, etc. Just googled it and came up with this interesting blog that describes it. They now call it a mixing fork as Foley no longer makes them. for some reason Google won't let me sign in with my usual name. My guess is a spaghetti fork because of the knobs at the end of the tines. Otherwise my guess would have been an asparagus fork. Right or wrong, it looks like the fork is a multi-purpose tool. I agree with Anonymous that it is a Foley fork, or Pastry Fork or Granny Fork. I searched, but didn't find one like yours. Intriging piece. I looked up the WMF mark on the handle. I found that this is a German company that dates back over a hundred years ago. They made silver table items and over the years branced into "...the volume of trade in household and kitchenware items between WMF and specialist retail shops." This would be a good place to start perhaps. I always called a pastry blender a "pastry cutter". I guess the terms are interchangeable. I asked for a pastry cutter on my shopping list when my Darlin; Man went to the store for last minute items before Christmas. An extra small thing to goin my stocking. Some days I want to send him to the store with PICTURES! i have one of these and i use it for spaghetti! They are very art deco as the MWFsliver website states in some of the company history narrative. Hope this gets you a better idea of at least where you might find anwsers. It looks like a sardine fork to me - a little unusual - but with the same features as one. Could it be a 'Kitchamajig'? I have no idea, but from looking at the images it looks most like the Foley fork. I googled the WMF, but didn't see anything resembling it, being sold now.natolys To me it looks like some type of mixing, blending fork. Interesting! Now I "need to know" too! 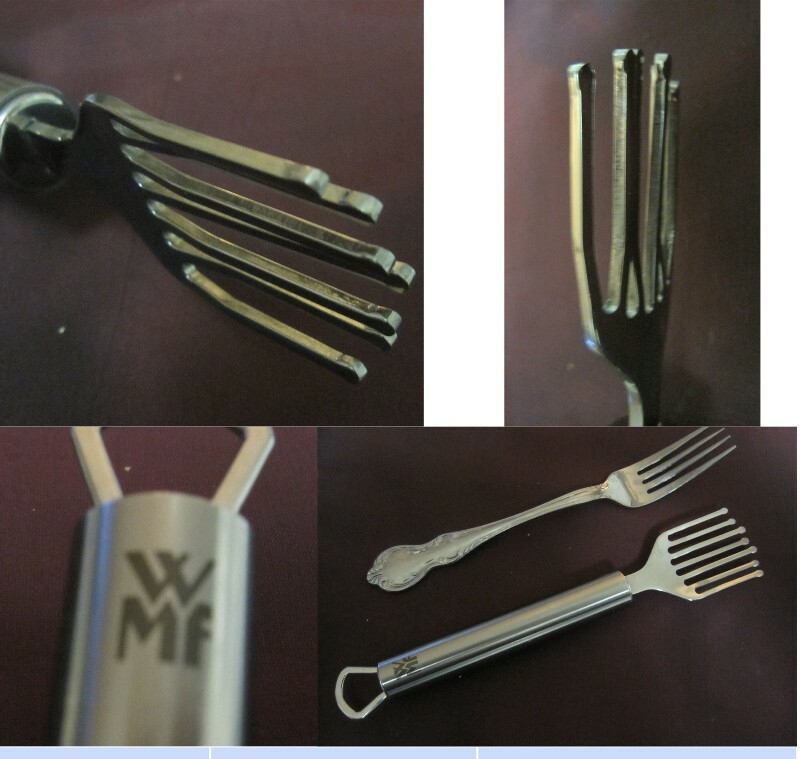 I e-mailed WMF and the customer service rep responded saying that she'd never seen anything like it and was forwarding it to their office in Germany. I have no idea what that is, but I am fascinated by all the research and now the question has even gone to the original company in Germany! I'll be interested to find out what the response will be. I, too believe its a foley fork. I have several & use it for mixing cake batter. Mine have black handles I can scoop flour up without it falling through the tines. Very interesting. I suppose you could use it as a pastry cutter. I have used a fork in a pinch, but my favorite tool to use as a pastry cutter is a wire wisk. I just hold it straight up and down and use to cut the fat into the flour! Works like a charm! Looks like the majority of readers agree this is a pastry fork. Do try it out for blending pastry and let us know how it works. It looks absolutely amazing and creative to boot. That looks like a sardine fork to me. Who cares...please! I don't know if there is a subject about which one could care less. I can't wait to find out what this is. I think it is for cake/pastry decorating as German Kitchens always have swirling / marbling / crimping details on pastries and cakes..normal forks don't marble nicely so the ridges would do that beautifully...so that would make sense. I never saw one of these growing up in Germany...so the answer will suprise! Didn't your Mother teach you that if you can't say something nice you should say nothing at all? Play nice or stay in at recess. If you don't care for the conversation then why are you reading the comments? Perhaps you should change to another site. How rude!!! That handle is the normal handle for that company's profi plus line. It won't look exactly like the Foley fork's handle because it's not made by Foley. I still think it's their version of a Foley fork. This is so interesting! I need to know what it is ~ regardless of what it shall be used for! So much fun and thank your Hubby for finding something so unique! I have never seen one of these...how FUN. 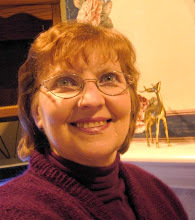 Just want to say...I love your posts...and your wisdom from scripture is ALWAYS so welcome. Keep up the great job!! My first thought was what a great tool to scoop out capers and olives. Blending cornstarch and flour water bases could be handier done with this multi-tonged utensil than your typical fork. Quite unique! It'll be interesting to see how many ways you use this foley fork regardless of its origin. It looks like something you'd dip into melted chocolate or glaze to drizzle across desserts or doughnuts. I believe it is a blending fork: http://www.tias.com/12908/PictPage/3923897367.html as they specialize in antiques. Here you go! This serving fork matches your blending fork. Still looking! lol have a great day! The company also makes a Nutella spreader, which I sent in a care package to my daughter, and she likes it a lot. That is the coolest ever lime/lemon juicer. That would explain the little balls on the ends of some of the tines. They will burst all the juice out of the citrus. Well then! That's interesting. I am so glad that curiosity is solved because I must admit, I was thinking about it on and off all day. I too love "kitchmajigs"! This morning, at Home Outfitters, I saw (and purchased) something called an "egg and omelette set - designed for perfect eggs", consisting of a small spatula that they call an "omelette turner", and a gizmo so very very similar to what you pictured, called a "whisking fork"! These are made for non-stick pans, by Calphalon. If the one you have is metal, it could have been designed for stainless steel, or perhaps cast iron. All kinds of possibilities! glad that mystery is solved! I love kitchen gadgets, so this one was a "stumper" Now we know!